Description: This splint is designed to provide firm wrist support by holding the wrist in a functional position of approximately 35 degrees of extension. An aluminum stay provides added rigidity. Indications: For immobilization of the wrist following acute sprain, fracture, inflammation and carpal tunnel syndrome. 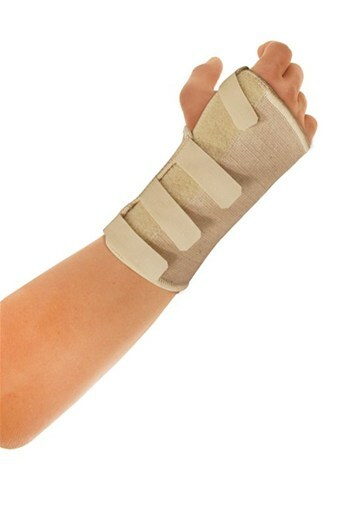 Provides excellent support post- plaster/cast removal and assists in reducing swelling around the wrist area. Fitting Instructions: Simply slid the thumb into the available opening and close the splint comfortably with the Velcro straps, as shown in the picture.